Accelerate Video Streaming of YouTube Videos and other streaming sites online! If you are fond of watching movies, videos online, then you know there are some basic must haves to make your experience more pleasant. First stop, a good internet connection. Second, a good fast pc/computer. Third, a good program that will do some magic tweaking for even faster, almost no buffering video streaming, and no buffering at all if you have a good internet connection. It's time to share what program/software can help you speed up or accelerate video streaming for free! No cost! Yes you hear me correctly! No need to spend money on this. What I am talking about is SpeedBit. SpeedBit Video Accelerator is a powerful application that lets you enjoy the world of internet video at accelerated speeds. When Video Accelerator is installed it configures itself automatically so you can start watching accelerated videos right away. This is free. I have it installed in my laptop as well. 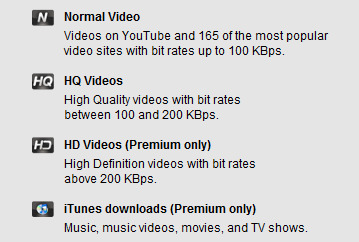 Works really great for youtube, facebook video, megaupload streaming etc. if you hate the buffering thing that takes like an eternity to finish, this is the best solution so far!